Although all of our collections are unique and exquisitely hand crafted, Artsaics provides the highly demanded option of creating, one of a kind, custom mosaics. Each mosaic possesses its own character. With dedication and attention to detail, all of our custom designs are produced specifically to our clients’ requests. Custom Mosaic Designs - how do you do it? Meticulously placing and hand shaping each individual piece of mosaic to perfection, we are capable of achieving the most impressive and realistic effects. We have created beautiful mosaic designs from such requests as landscapes, artistic designs, animals, icons and logos, and more. 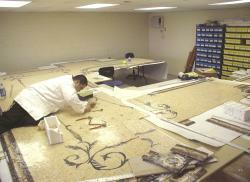 Use your imagination...whatever you can think, we can create a custom mosaic design for.